When you think of transmission repair, do you think of it as an expensive repair that means your vehicle is basically worthless now? You shouldn’t. While transmission repair is one of the pricier repair jobs you can have done on a vehicle, the fact is that you can still save money compared to buying a new vehicle. Keeping an older car in good shape is one of the parts of a frugal lifestyle, and even though it costs money to get a transmission fixed, it can give your vehicle a whole new lease on life. 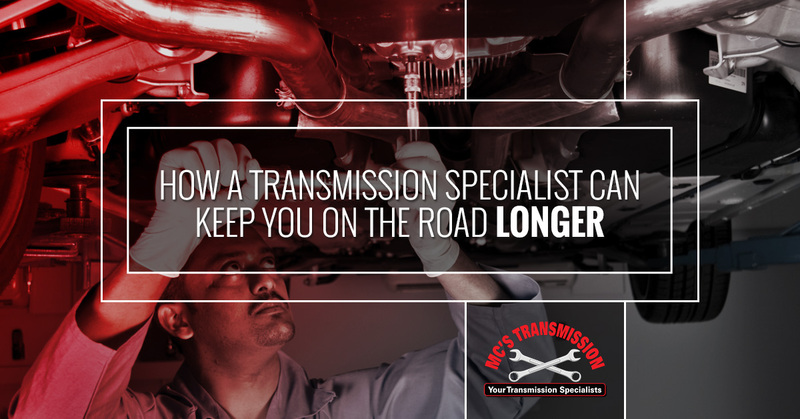 In this blog post from MC’s Transmission, we’d like to cover some of the ways that your transmission specialist can keep you on the road longer. 1. Your transmission specialist takes care of one of the most critical components of your vehicle. Your engine and your transmission are two of the most vital components on every vehicle. If those two things are in good shape, you can often have a problem-free vehicle, even when it’s an older model. Sure, you still need to change the fluids and the tires every so often, but a solid transmission can take you for miles. Your transmission specialist makes it a point to ensure that your transmission is in tip-top shape to last as long as possible. 2. Your transmission specialist has more knowledge when it comes to fixing a broken transmission. What happens when your factory transmission finally bites the dust? At that point, new transmissions are no longer available for sale. They tend to stop being made when the production year ceases for your vehicle make and model. Your two options are to replace the transmission with one from a junkyard or else rebuild the transmission. Sadly, many people turn to their general mechanic to get the transmission repair they need, and these people often do not possess the skills and knowledge to do specialized transmission work. They may replace your transmission with a junkyard model that is just as close to failing as yours was a few months ago, making it only a matter of time before your vehicle is in the shop for yet another transmission issue. The least reputable shops will charge you for a rebuild but install a salvage transmission instead. Don’t go that route! Instead, take your transmission to a specialist, someone who can rebuild a transmission to get it into the best-possible working order and ensure that you get a long life out of it. 3. Your transmission specialist has better transmission diagnosis skills. Diagnosing a transmission problem incorrectly can lead to costly repairs and extended amounts of time that your care is in the shop. You don’t deserve to pay for someone to experiment with trial and error before they get it right. You also don’t deserve to be charged for a big problem when your transmission only has a small problem. A transmission specialist has diagnosed every transmission problem in the book, and they can often get your diagnosis more quickly and accurately. Come in to see the friendly transmission specialists in Livonia today!